Whitening teeth is a simple yet very effective method to brighten up your face. Often, whitening alone is enough to bring noticeable changes to a smile. Whitening works best on teeth that are discoloured by cigarette smoking, tea or coffee. It can be a very efficient way of lightening the natural colour of your teeth without removing any of the existing tooth enamel. Bleaching cannot effectively change the complete colour of your teeth, but it can help in lightening the existing shade. Whitening is a popular method used to make teeth brighter and more attractive. Bleaching can be used for whitening discoloured and stained teeth, or simply to enhance a dull smile. Either way, tooth whitening is a relatively painless and safe procedure which is ideal for most patients. The effects of whitening are expected to last for up to three years. However, this varies from patient to patient. The effect is less likely to last this long if you eat or drink products that could stain your teeth or if you are a smoker. Do not hesitate to ask our dental team for their opinion before the start of the treatment. 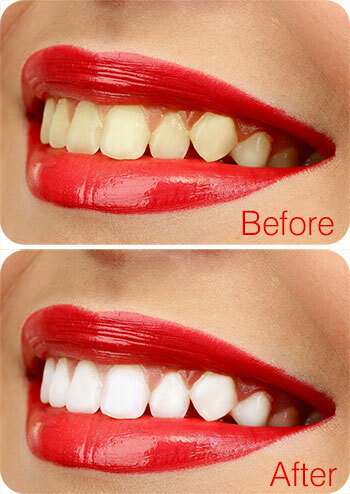 Professional bleaching is the most popular method of teeth whitening. Our team will advise you if you are suitable for this treatment. If you need your teeth whitened, we recommend the removal of any existing decay and treatment of restorations if any, prior to this procedure. Most patients desire cosmetic dentistry but our team is committed to maintaining healthy and bacteria-free teeth prior to any elective procedures including whitening, veneers, crowns, bonding and dental implants. The Zoom! Chairside Whitening system is a scientifically advanced, patent pending, tooth whitening procedure. It’s safe, effective and fast, very fast, in less than an hour your teeth will become dramatically whiter. Zoom! Chairside Whitening is ideal for anyone looking for immediate results. The convenience of Zoom! in comparison to days of wearing trays or strips, makes it the perfect choice for the busy individual. The Zoom! In-Office Whitening System will make your teeth dramatically whiter in one bleaching visit. The procedure is simple. It begins with a short preparation to cover your lips and gums, leaving only your teeth exposed. The Zoom! clinician then applies the proprietary Zoom! Whitening Gel, which was designed to be used with an especially designed light. The Zoom! light and gel work together to gently penetrate your teeth, breaking up stains and discoloration. With proper care your smile will sparkle for years. Yes. Extensive research and clinical studies indicate that whitening teeth under the supervision of a dentist is safe. In fact, many dentists consider whitening the safest cosmetic dental procedure available. We recommend an initial consultation at our office to evaluate your teeth to determine if bleaching is appropriate for you and to explain the procedure to you in detail. As with any tooth whitening product, Zoom! is not recommended for children under 13 years of age and pregnant or lactating women. By following some simple post whitening care instructions, your teeth will always be lighter than they were before. To keep your teeth looking their best, we recommend flossing, brushing twice daily, and occasional touch-ups with custom bleaching trays and gel which are made for you. These are professional formula products designed specifically to keep your teeth their brightest. They are available only through your dental professional. The Zoom! light activated whitening gel's active ingredient is Hydrogen Peroxide. As the Hydrogen Peroxide is broken down, oxygen enters the enamel and dentin, bleaching colored substances while the structure of the tooth is unchanged. The Zoom! light aids in activating the hydrogen peroxide and helps it penetrate the surface of the tooth. A study has shown that use of the Zoom! lamp increases the effectiveness of the Zoom! gel by 26% or more, giving an average improvement of eight shades". The Zoom! procedure requires that all soft tissue in and around the mouth be protected. The clinician is required to monitor the procedure to insure any exposed skin or tissue is isolated and protected. Protective eyewear is required during the procedure. Light sensitive individuals, including those undergoing PUVA therapy (Psoralen+UV Radiation) or other photochemotherapy, or patients with melanoma, should not undergo the Zoom! in-office procedure. Also, patients taking any light sensitive drugs or substances, whether over the counter, prescription or homeopathic, should consult their primary care physician prior to the procedure. Anyone who is not eligible for Zoom! Chairside Whitening for these reasons may be an excellent candidate for Zoom! Take-Home. Sensitivity during the treatment may occur with some patients. The Zoom! light generates minimal heat which is the usual source of discomfort. On rare occasions, minor tingling sensations are experienced immediately after the procedure, but always dissipate. Tooth whitening is a well established procedure in cosmetic dentistry. Hydrogen Peroxide, the active agent in Zoom!, has been safely used for many years in the treatment of gums and other oral soft tissue. The whitening process is effective on most discoloured teeth. Darker stains, such as those caused by antibiotics, are more difficult to whiten. The degree of whiteness will vary from patient to patient, depending on the structure of the teeth. If you have any questions, please ask your dental professional. Maximize your smile using the Zoom! Whitening System.